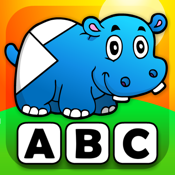 ***** Top selling education app. The iPad version Ranked #1 app for kids in many countries. Selected as New & Noteworthy! The long-awaited new puzzle game from 22learn is coming also to your iPhone/iPod! Do you want some fun for your child? Abby's Preschool Shape Puzzles is a must-have! Let your toddlers play with it, while developing their fine motor skills, and learning names of numerous objects! Abby's Preschool Shape Puzzles, developed by well-loved educational experts with more than two-decade old teaching experience, is a wonderful game for all toddlers. Try it and enjoy how your children make progress while being engaged! Buy this app from our extremely successful series right now! What's more, not only will your children love the art of an object assembly, but they will also be kept constanly motivated by the all funny, happily enthusiastic monkey, who is there always ready, waiting to articulate the praise children deserve for their patient efforts! Children will be wondering: how will the monkey show up this time? Will it arrive in its car, or downright jump jovially down with the parachute? And more yet -- yes... we are willing to go to a great lenghts for you -- you can rely on our updates of the various ways the monkey can appear! Your children will thus be sure to quickly fall in love with the monkey character! If you have any suggestions on how we could further improve the design of our apps, please leave us a message at info@22learn.com. We always appreciate comments on how to make our apps even better!